We have this famous proverb in Indonesia: tak kenal maka tak sayang (more or less translates to: you can’t love something you don’t know). Perhaps this too, is the case with the most eastern part of Indonesia, in which, in my opinion, usually refers to Nusa Tenggara Timur, Maluku, and Papua. With more than 17,000 islands, Indonesia is indeed a vast archipelago, and it is still pretty rare even for a native who has lived his or her entire life in the western part of Indonesia–let’s say, the islands of Sumatra and Java–to visit its eastern counterparts for vacation purposes. For instance, a lot of people see Papua as a remote region lacking adequate infrastructure, thus raising concerns related to safety and cost–airfare and accommodation are pretty pricey compared to other places. That assumption related to the cost may be true to a certain extent, but I should say that safety shouldn’t be an issue, for from what I observed, the places in Papua that I went to (Sorong and Raja Ampat, both located in the province of West Papua) are relatively safe and tourist-friendly. Here is a story about my 5-day vacation to Sorong and Raja Ampat with my family. Before I go any further, I should mention that I travel as part of a group, so I simply followed the scheduled itinerary and have no idea about booking accommodation, diving spots, and stuff like that. However, there is plenty of information on the internet – click here for a really good website with lots of useful tips. OK, now moving on to the main story. How to get there? I flew XpressAir from Jakarta to Sorong, and the flight took around 3.5 hours. I departed at midnight and arrived in Sorong at 7 AM, taking the 2-hour difference between Jakarta and Sorong into account. I recommend using this airline for a direct route, since usually the others–such as Garuda Indonesia and Sriwijaya–tend to stop first in Makassar and it will take you a considerably longer travel time. The price for a one-way ticket can range between 2-5 million rupiah (USD 200 – 500); I got mine for 4 million rupiah. Where to stay in Sorong? I checked in to Belagri Hotel directly upon arrival, where I stayed for one night before leaving for Raja Ampat the next day. The hotel is pretty nice, considering the fact that it has just opened for four months and everything still looks new. I didn’t really do much that day, basically just taking a rest and getting ready for Raja Ampat. My first impression of Sorong? It’s just like another small city in other parts of Indonesia I’ve been to: considerably less crowded and smaller and fewer buildings compared to Jakarta. How to get to Raja Ampat? The next morning, we took a boat ride from a nearby harbor just 10-minute drive away from our hotel. It’s not a public boat, though, and if I’m not mistaken, the public boat departs from a different harbor. If you wish to charter a speedboat as part of a group, I think it costs around 25 million rupiah for a day, and it can fit around 25 people. The reason why it is so expensive is that due to the high price of gasoline there. 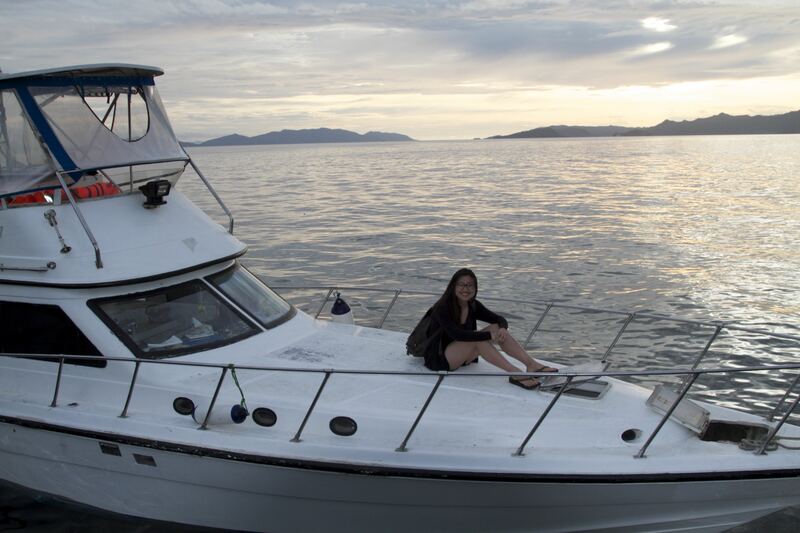 The perk of chartering your own boat is that you can go island hopping wherever you want, basically. 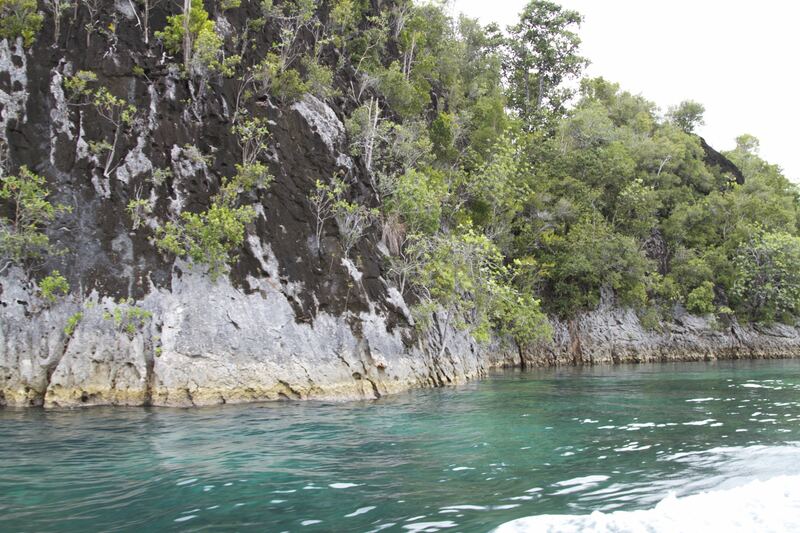 So if you haven’t yet known, Raja Ampat consists of a bunch of islands, few bigger ones and lots of smaller ones. The public boat will get you to one of the big islands of Raja Ampat, Waigeo, and more specifically to the city of Waisai. And from there, there are no public transportation to bring you to other islands in Raja Ampat. If you stay at a relatively luxurious resort, they’ll have their own boat that you can use–not sure if it’s free or not, so you should check with each resort about this. Anyway, it took us 2 hours to get to our first destination, the island of Kri Kecil (Little Kri). I really enjoy the ride; I climbed up to the top of the boat and just stayed there enjoying the scenery, looking at countless of small islands we passed by, still extremely lush and untouched by humans, with the bright and warm sunshine and occasional sea breeze–boy, it was wonderful. You can see pretty much no one in the vicinity, except occasionally there would be other boats passing by. Especially after coming back from a place where it’s snowing and gloomy and cold, 1000 times better. Okay, maybe I’m a bit exaggerating, but still, nothing beats the wonder of tropical islands! What to do in Raja Ampat? Uh, so I didn’t dive. 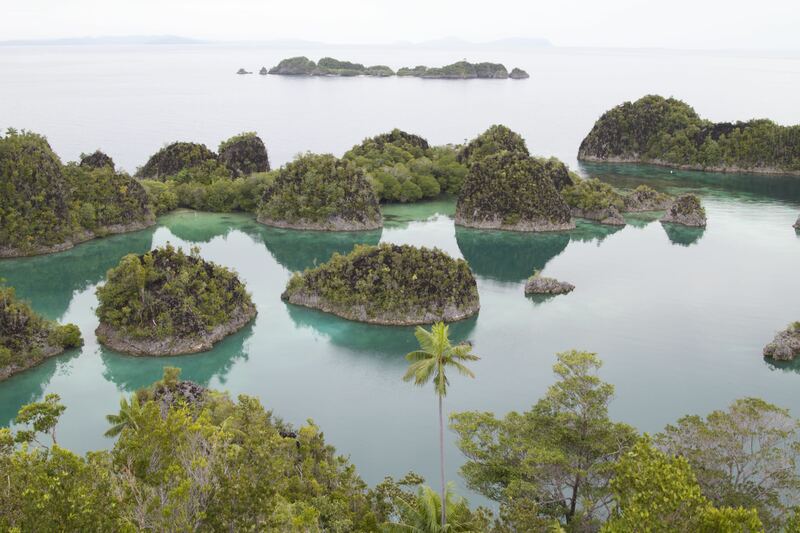 I know, I know, Raja Ampat is the ultimate destination for divers, and I didn’t do diving? The main reason is that this is just a family gathering kind of thing and almost no one in our group knows how to dive, so it wasn’t part of the planned activities. Neither do I, though I really want to get a diving license in the near future (which is why I’m definitely coming back to Raja Ampat!) And because I didn’t organize the event, there was nothing I could do. Instead, we did snorkeling. 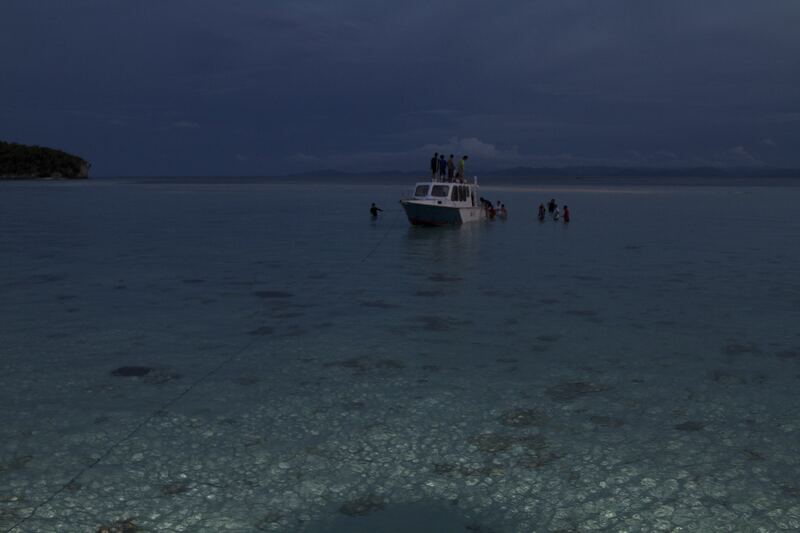 We got off at Kri Kecil to snorkel there–the water was extremely shallow, only around 2 m deep. The scenery was beautiful. The water was extremely clear near the island and as it went farther away you could see the color transition. I really like the bright light blue color the islands of Raja Ampat have! The view underwater, however, although beautiful, is not that spectacular. 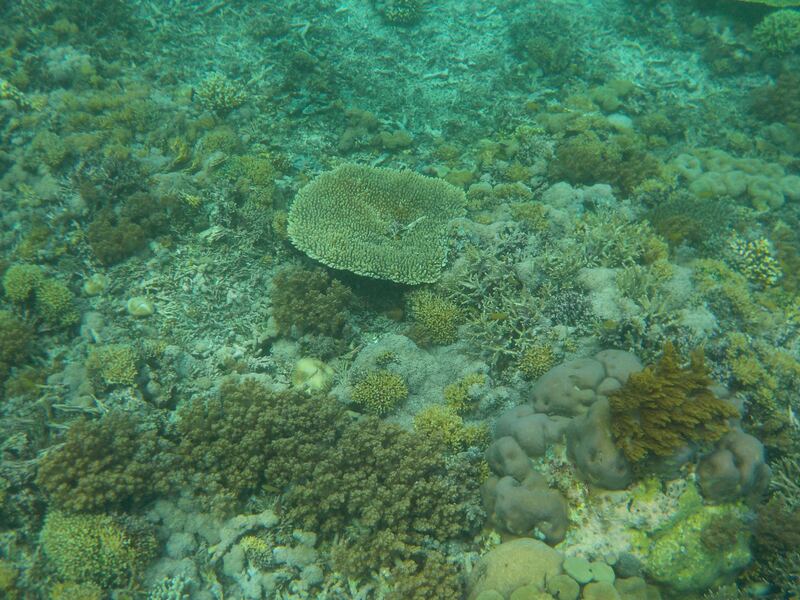 Most of the corals were pale and some destroyed due to the current, and there weren’t a lot of fishes. I think that’s because we went to the shallower water? The next place we went to, which is the water by Sawandrek Island and around 5 m deep, was better, though again, not as beautiful as I expected. Perhaps some deeper water has better view. There were 25 people in my boat and I think it just made it easier and safer if we opted for shallow water for snorkeling. I’ve heard people saying that Raja Ampat is best for diving but not quite for snorkeling, but then again, do some research and see if you can find better snorkeling spots! What we did the next day was taking a cruise along the Kabui Bay to have a closer look at the island and seeing Telaga Bintang, a cluster of coral islands with a star-like formation that you usually see on promotional posters of Raja Ampat, from the top of the Painemo Island. The views of both Kabui Bay and Telaga Bintang were amaaaazing. When we passed through Kabui Bay, I again climbed up to the top of the boat and seeing the view without being blocked by the top and side of the boat was even better! We were also supposed to go to Pasir Timbul, a small island that is located just slightly below the sea level, so you can only see it and get off to the island when the tide is low. Unfortunately, we didn’t come at the right time so it was still submerged. We only stayed in Raja Ampat for one night and returned back to Sorong the next afternoon. There aren’t really a lot of things to see in Raja Ampat so even two days were sufficient to see most of them, but I would definitely recommend a longer stay for diving and just enjoying the beautiful view. Here are more pictures taken during my stay in Raja Ampat. What did I do in Sorong? We went to visit a village and meet some locals. Now I started to get intrigued by what I saw, as I have lived my entire life in the city. What I found most interesting was the quaint stillness, and how devoid of people that place was. I don’t know exactly how to put what I saw into words, so I’ll let the pictures speak for themselves! The bottom line? Though the trip was rather short, and I didn’t get to see much of West Papua, I will definitely go back for a longer visit and hopefully for a chance to dive and enjoy the deepwater scenery of Raja Ampat. I really like that you rarely see other tourists and it’s just such a nice way to escape from the hustle-bustle of the city and enjoy the beauty of nature at its very finest. I’m grateful to be able to get to know a tiny speck of eastern Indonesia, and hopefully have the chance to visit more places there too! That marks the end of this rather lengthy post, and I wish you a happy new year. Here’s to a wonderful year with lots of hard work that will turn into success and experiences that will turn into memories to cherish for a lifetime! As for me, a modest resolution includes to write more blog posts!